Show how each alcohol can be prepared from a combination of a carbonyl and a Grignard reagent. 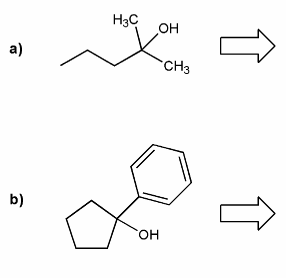 The trick to these retrosynthesis problems is to determine where the connections or "cuts" were made. The carbonyl carbon becomes an alcohol after a Grignard reaction, so that's where the "cut" must be. Note that there can often be more than one correct answer to these types of problems. For a), adding propyl Grignard to acetone or methyl Grignard to 2-pentanone will result in the product. We can also use two equivalents of methyl Grignard with 4-carbon ester, such as ethyl butanoate. Esters contains a build in leaving group (-OR) and so react twice with Grignards. For b), adding phenyl Grignard to cyclopentanone will do the job. MendelSet practice problem # 668 submitted by Matt on July 18, 2011.